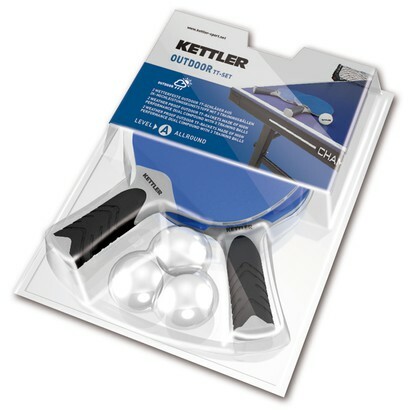 The Kettler Outdoor table tennis bat set offers maximum control while playing table tennis and the Kettler table tennis bats are great for beginners. As the outdoor tt bats are weatherproof and durable, they are optimal as accessory for the Kettler outdoor table tennis boards. The table tennis bats have a concave softtouch handle of new ERGO-GRIP design. The Kettler tt bats rest very good in the hand and increase additionally the playing comfort. 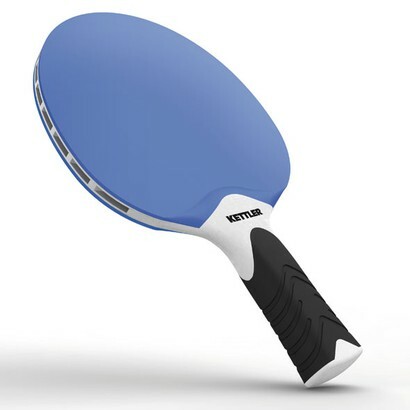 The outdoor table tennis bats have an even surface and guarantee a very good ball control. Being made of 2K high-performance plastic, the allround table tennis bats are light and hard-wearing. Great - very good grip, comfortable to hold and appear very well made. The rackets appear to be all in one, so no joins or places where the rubber and paddle could come apart - very pleased. Kestävän tuntuisia. Pienikin käsi saa tukevan otteen mailasta.